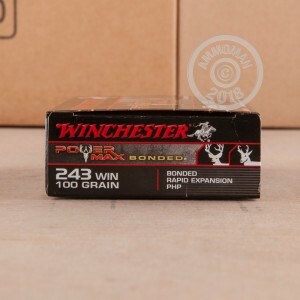 243 Winchester Power Max rounds are the perfect choice for deer hunters. 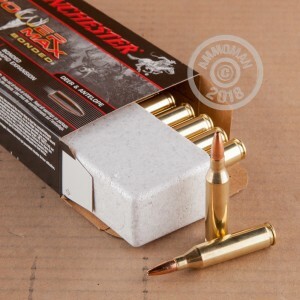 Winchester developed the Power Max Bonded rounds specifically for whitetail hunting. The boxer primed brass cases house a 100 grain projectile that is a Protected Hollow Point. You can expect to see an average muzzle velocity around 2,960 feet per second. These bullets are bonded which is a process that adheres the copper jacket to the lead core. The result is a round that mushrooms for knockdown power, but retains most of its weight and does not fragment. 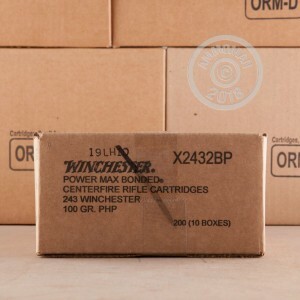 Winchester's Power Max provides high preform at an affordable price. Place any order over $99 and AmmoMan.com will ship your order for free!